Preheat oven to 400°F. Line a baking sheet with aluminum foil and place uncooked bacon slices on top. Bake bacon until crispy and cooked through, about 20 minutes. Remove from oven and place bacon on a paper towel-lined plate to absorb any extra grease. Heat oven to 350°F. In a large bowl, whisk together flour, baking powder, sugar and salt. In a separate large bowl, whisk together eggs, butter and buttermilk. Pour wet ingredients into dry ingredients and stir to combine. Crumble cooled bacon into small pieces and add to batter. Add corn kernels, creamed corn and cheese and fold into batter. Pour batter into a lightly greased loaf pan or casserole dish. Bake until golden brown and a toothpick inserted in the center comes out clean, about 1 hour to 1 hour, 15 minutes. Remove cornbread from oven and cool 5 minutes in pan before removing and placing on a cooling rack. Cool completely before slicing. There is an age-old proverb, a timeless mantra if you will, a well-known quote out there that tends to ring true with most things, and one I choose to live by often: It's better with bacon. It's true, isn't it? Brownies are better with bacon bits inside the batter. Meatloaf is better wrapped in bacon. Bacon is better with extra bacon on top of it. And this Bacon Cornbread? It's just not the same without bacon (of course, the pieces of fresh corn and shredded sharp cheddar cheese melted inside help too, but that's BESIDE THE POINT). Anyway, as I was saying: Bacon. You bake it up until it's all crispy-like, toss it into a buttermilk batter of the simplest kind, fold it in alongside some golden corn kernels and cheddah, bake it up and voila! 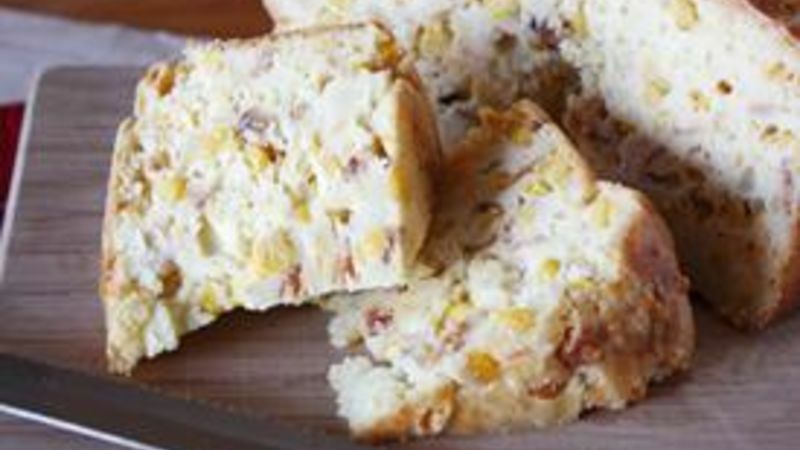 A seriously savory, seriously cheesy, seriously corny, seriously yummy cornbread. Seriously. All aboard the bacon traaaaiiiinnnn! Let's start with -- SURPRISE -- the bacon. I like to bake it in the oven because it's easier that way, but you can git 'er dun however you like. Just be sure to make it super crispy so it crumbles well and doesn't get your cornbread all greasy. Because that's gross. While the bacon's doing its thang, whisk together the dry ingredients. EXCITING STUFF, I know. Trust me, it gets even better. Now whisk together the wet ingredients (which includes a whole dang stick of butter. You're welcome). YOU CAN BARELY HANDLE THE EXCITEMENT. But hold on tight, because we're not done! Pour the wet ingredients into the dry ingredients. Oh meeeeeeee myyyyyy lawdy, my mind just exploded from all this madness. Good thing we're almost there. Stir together the wet and dry ingredients until they're well combined, then fold in the cooled and crumbled bacon, the corn kernels, the creamed corn kernels and the cheddah. Anything is bettah with cheddah. Oh, and BACON. Once that's all stirred up and folded in and whatnot, pour the batter into your prepared pan (a loaf pan works well for this, too) and bake it until it's all nice and golden brown and baked through. LIKE THIS. Oh Mylanta, this looks delicious. All that's left to do now is eat – my favorite part. It’s extra yummolicious with some Muir Glen black bean soup on the side. There you have it! More proof that bacon makes anything better.